Flipkart is one of the most famous e-commerce company in India. Flipkart was founded by Sachin Bansal and Binni Bansal in the year 2007. Flipkart is having around 22 million registered users and handles 5 million package delivery every month. 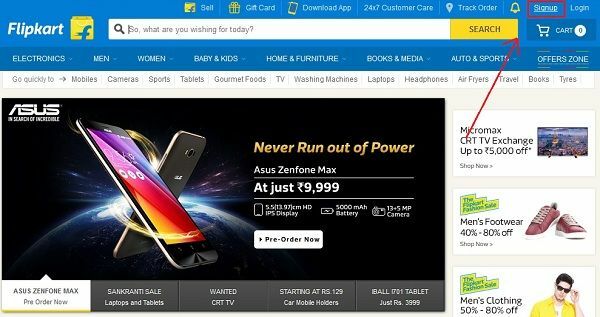 In this article, we are discussing how to create a Flipkart account in 3 simple steps. Step 1: First go to the Flipkart official website, i.e. “www.flipkart.com” and then click on the “Signup” button as shown in the image below. Step 2: In the next step, you need to provide your mobile number to continue further. Step 3: After a while, you may receive an OTP (One time password) for user validation. In the next step, you need to enter the same OTP with your mobile number and password and then click on the “Sign Up” button, as shown in the image below. I don’t have Indian mobile number, i would like to use foreign mobile number or email id. Please let me know if i can do this? Flipkart operates only in India. So, you can not create an account with a foreign number.